We have been playing with google maps to provide a simple and free online Postcode map resource for quite some time. After some review about how to best make this work - in particular with some Google Maps limitations - we are trying out a new site which is dedicated to the provision of free online Postcode maps. Currently the site utilises the Google Maps search tool to allow you to search for a town, Postcode or county in the UK and display the Postcode Districts or Sectors for that area. Postcode District and Sector boundaries can be toggled on or off on the map by simple buttons in the top right of the map. 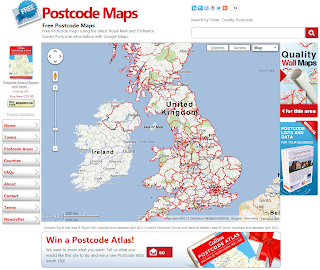 In addition, there are menu options to view predefined Postcode maps for selected towns, Postcode Areas and Counties. We hope this is the first phase of an on-going Postcode mapping development and, as such, we have a competition running for visitors to give us their feedback on what they would like the site to do next. These responses will help drive the next features we will look to add to the site over the coming months either free of charge or for a small subscription fee. We welcome all feedback on the site so please hop over to have a look and use one of the methods on the site to let us know what you think and how you think the site could be improved.